Onyx Mesh 2 Tray/6 Sorter Desktop Organizer transforms desktop clutter into an organized, more productive workspace. It features a stronger, thicker, commercial-grade steel with a powder coat finish for years of heavy, repetitive use. Organizer includes two horizontal trays to keep essential letters and documents at your fingertips and six 2" wide vertical sections for file folders, binders, notebooks, and textbooks. Ideal for use in cubicles, home offices, mailrooms and desks/tables. The Onyx Family includes a diverse collection of stylishly-designed steel mesh products, from desktop organizers to machine stands. Onyx makes it easy to create a sleek, professional, organized workspace. STURDY, STYLISH STEEL. 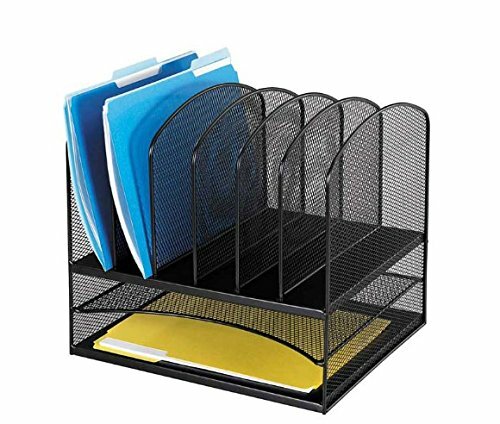 Onyx Mesh 2 Tray/6 Sorter Desktop Organizer looks sleek and sophisticated but is constructed with durable, thick commercial-grade steel to endure years of heavy, repetitive use. EFFICIENT ORGANIZATION. Six 2" wide sections make easy work of desktop clutter by displaying important files and binders vertically for quick selection. Two horizontal trays conveniently hold mail, stacks of paper, catalogs, folders, and envelopes. BUILT TO LAST. Durable, powder coat finish helps resist chipping or scratching. The mesh design promotes air flow to reduce dust buildup for less maintenance. STORAGE SOLUTION. Its dual configuration, with two horizontal trays and six vertical sections, doubles desktop storage for efficient use in personal workspaces, corporate mailrooms, cubicles, dorm rooms, home offices, family rooms, and kitchens. MAXIMUM STORAGE. Overall product dimensions: 13 3/4"W x 11 1/2"D x 13"H for a reduced footprint on any work surface. No assembly required.